May 17, 1954: Reversed and remanded (9–0), sub. nom., Brown v. Board of Education of Topeka, 347 U.S. 483 (1954). 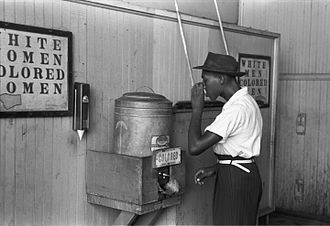 Briggs v. Elliott, 342 U.S. 350 (1952), on appeal from the U.S. District Court for the Eastern District of South Carolina, challenged school segregation in Summerton, South Carolina. It was the first of the five cases combined into Brown v. Board of Education (1954), the famous case in which the U.S. Supreme Court declared racial segregation in public schools to be unconstitutional, violating the Fourteenth Amendment's Equal Protection Clause. Following the Brown decision, the district court issued a decree striking down the school segregation law in South Carolina as unconstitutional, and requiring that state's schools to integrate. In 1949 the NAACP agreed to provide funding and sponsor a case that would go beyond transportation and ask for equal educational opportunities in Clarendon County. The first step was to craft a local petition for educational equality. This was done by Rev. Joseph Armstrong DeLaine and Modjeska Monteith Simkins, the noted South Carolina civil rights worker. Simkins organized a national charitable effort for the relief of the oppressed blacks of Clarendon County. Eventually, more than 100 Clarendon residents signed the petition. The case would ordinarily have come up before Judge Julius Waring of the U.S. District Court for the Eastern District of South Carolina. However, Judge Waring recommended to Thurgood Marshall that the case be expanded from an equalization case into a desegregation case. 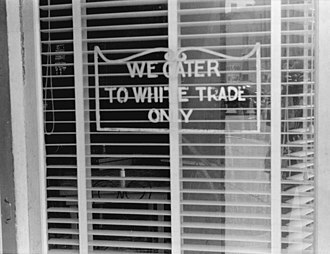 Instead of asking for enforcement of the separate but equal doctrine by bringing the black schools up to equality with the white schools, the plaintiffs asked for school segregation to be declared unconstitutional. By expanding the case, Waring and Marshall both expected the plaintiffs to lose the case 2-1 and for the case to end up in the Supreme Court. As predicted, a three-judge panel found segregation lawful by a vote of 2-1, with Judge Waring writing a dissent in which he stated that "segregation is per se inequality." The panel also granted an injunction to equalize the uncontested inferiority of the schools used by African American students. In 1952 the Supreme Court heard the case and returned it to the district court for rehearing after Clarendon County school officials sent a report on progress in making facilities equal. In March the district court again heard the case. The Court found that progress had been made towards equality. Thurgood Marshall argued that this may be true, but that the real issue was that as long as separation existed, the schools would be unequal. So the case was appealed back up to the Supreme Court in May. The case was then consolidated with several other school desegregation cases into Brown v. Board of Education. Briggs was the first of the five Brown cases to be argued before the Supreme Court. Spottswood Robinson and Thurgood Marshall argued the case for the plaintiffs, while former Solicitor General and Presidential candidate John W. Davis led the argument for the defense. Although Brown resulted in a legal victory for the NAACP, it was a hollow victory for those associated with Briggs. Reverend Joseph De Laine, the generally acknowledged leader of Summerton's African-Americans at the time, was fired from his post at a local school in Silver. His wife Mattie was also fired from her position at Scott's Branch, as were all the other signers. De Laine's church was also burned and he moved to Buffalo, New York in 1955 after surviving an attempted drive-by shooting. Harry and Eliza Briggs, on behalf of whose children the suit was filed, both lost their jobs. Harry spent more than a decade working in Florida to support the family. Eliza eventually joined her children in New York. Eventually, the State of South Carolina awarded Eliza Briggs its highest civilian honor, the Order of the Palmetto. Reverend Joseph A. De Laine, Harry and Eliza Briggs, and Levi Pearson were awarded Congressional Gold Medals posthumously in 2003. ^ Briggs v. Elliott, 342 U.S. 350 (1952). 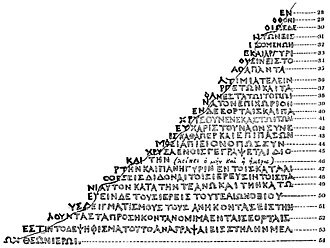 This article incorporates public domain material from this U.S government document. ^ a b Brown v. Board of Education of Topeka, 347 U.S. 483 (1954). ^ "Brown Case - Briggs v. Elliott | Brown Foundation". brownvboard.org. Retrieved 2017-07-10. ^ Briggs v. Elliott , 98 F. Supp. 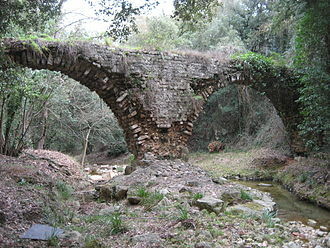 529 (E.D.S.C. 1951). ^ "Bitter Resistance: Clarendon County, South Carolina". Separate is Not Equal. National Museum of American History. 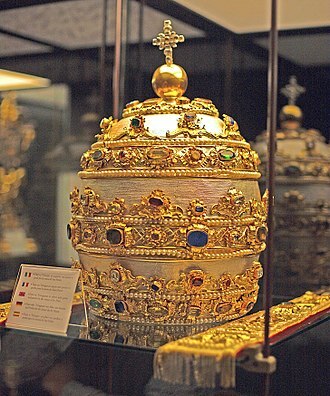 Retrieved 29 November 2015. ^ Briggs v. Elliott , 132 F. Supp. 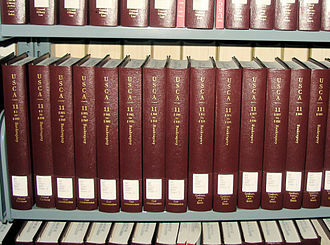 776 (E.D.S.C. 1955). ^ "How The Son Of A Confederate Soldier Became A Civil Rights Hero". April 10, 2014. That decision was the catalyst for attacks on Judge Waring so intense that he required 24-hour security. Crosses were burned in his yard. Rocks were thrown through his windows. Waring was alienated from most of white Charleston. A local magazine described him as the lonesomest man in town. 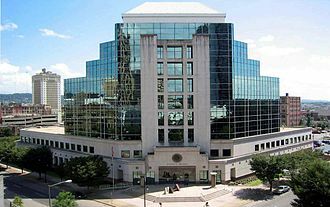 ^ "Charleston U.S. Justice Center Renamed for Pioneering Civil Rights Judge Julius Waties Waring". 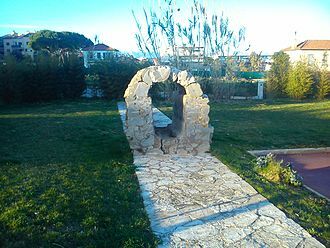 GSA. October 2, 2015. Waring’s challenges to the racially discriminatory practices of that era came at great personal expense, as he and his family were vilified and received constant death threats. Waring retired from the bench in 1952 and moved to New York City, where he died on January 11, 1968, at age 87. ^ Rosen, Robert N. (April 10, 2014). "Judge J. Waties Waring: Charleston's inside agitator". The Post and Courier. Archived from the original on November 29, 2015. Waring retired from the bench after the Briggs case and moved to New York with his wife. On the night of the Brown decision, Walter White, the president of the NAACP, and other civil rights leaders in New York headed not for the NAACP headquarters, but for Judge Waring's apartment on Fifth Avenue. 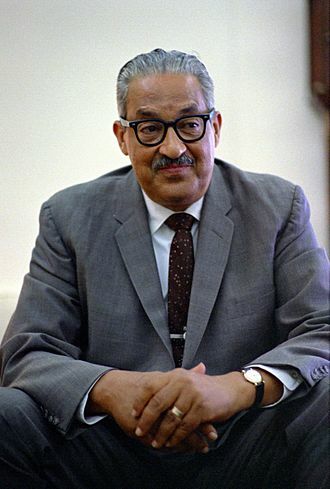 Thurgood Marshall was an Associate Justice of the Supreme Court of the United States, serving from October 1967 until October 1991. 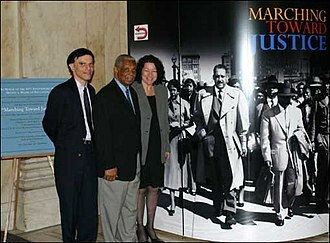 Marshall was the Courts 96th justice and its first African-American justice and he served on the United States Court of Appeals for the Second Circuit after being appointed by President John F. Kennedy. He was appointed as the Solicitor General by President Lyndon Johnson in 1965, President Johnson nominated him to the United States Supreme Court in 1967 and he was approved by the Senate. Marshall was born in Baltimore, Maryland, on July 2,1908 and his original name was Thoroughgood, but he shortened it to Thurgood in second grade because he disliked spelling it. His father, William Marshall, worked as a porter, and his mother Norma, as a teacher, they instilled in him an appreciation for the United States Constitution. Marshall attended Frederick Douglass High School in Baltimore and was placed in the class with the best students and he graduated a year early in 1925 with a B-grade average, and placed in the top third of the class. It is commonly reported that he intended to study medicine and become a dentist, but according to his application to Lincoln University, Marshall said his goal was to become a lawyer. Among his classmates were poet Langston Hughes and musician Cab Calloway, initially he did not take his studies seriously, and was suspended twice for hazing and pranks against fellow students. He was not politically active at first, becoming a star of the debating team, in his freshman year he opposed the integration of African-American professors at the university. Hughes described Marshall as rough and ready and wrong, in his second year Marshall participated in a sit-in protest against segregation at a local movie theater. In that year, he was initiated as a member of Alpha Phi Alpha, Marshall wanted to study in his hometown law school, the University of Maryland School of Law, but did not apply because of the schools segregation policy. Marshall instead attended Howard University School of Law, where he worked harder than he had at Lincoln, in 1933, he graduated first in his class at Howard. After graduating from law school, Marshall started a law practice in Baltimore. He began his 25-year affiliation with the National Association for the Advancement of Colored People in 1934 by representing the organization in the law school discrimination suit Murray v. Pearson, in 1936, Marshall became part of the national staff of the NAACP. In Murray v. Black students in Maryland wanting to study law had to attend segregated establishments, Morgan College, whatever system is adopted for legal education must furnish equality of treatment now. 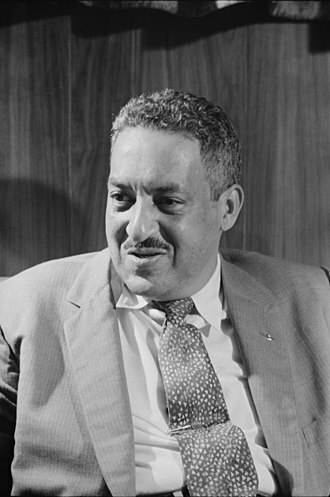 At the age of 32, Marshall won U. S. Supreme Court case Chambers v. Florida,309 U. S.227 and that same year, he founded and became the executive director of the NAACP Legal Defense and Educational Fund. 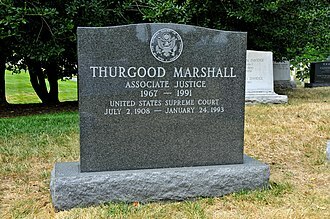 In total, Marshall won 29 out of the 32 cases he argued before the Supreme Court, during the 1950s, Thurgood Marshall developed a friendly relationship with J. Edgar Hoover, the director of the Federal Bureau of Investigation. In 1956, for example, he privately praised Hoovers campaign to discredit T. R.
The Equal Protection Clause is part of the Fourteenth Amendment to the United States Constitution. 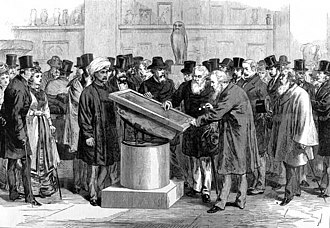 The clause, which took effect in 1868, provides that no state shall deny to any person within its jurisdiction the equal protection of the laws. 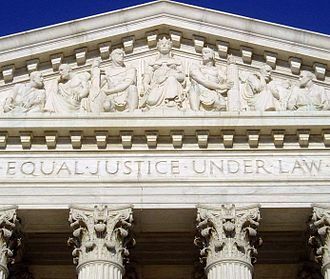 The meaning of the Equal Protection Clause has been the subject of much debate and this clause was the basis for Brown v. The Equal Protection Clause itself applies only to state and local governments, the Supreme Court held in Bolling v. Sharpe that equal protection requirements apply to the federal government through the Due Process Clause of the Fifth Amendment. Before and during the Civil War, the Southern states violated the rights of speech of pro-Union citizens, anti-slavery advocates. During the Civil War, the Southern states stripped many white citizens of their citizenship and banished them from the states. Shortly after the Union victory in the American Civil War, the Thirteenth Amendment was proposed by Congress and ratified by the states in 1865, many ex-Confederate states adopted Black Codes following the war. These laws severely restricted the rights of blacks to hold property, including property and many forms of personal property. These codes created harsher criminal penalties for blacks than for whites, because of the inequality these Black Codes imposed, Congress enacted the Civil Rights Act of 1866. This Act provided that all born in the United States were citizens. Full and equal benefit of all laws and proceedings for the security of person and property, president Andrew Johnson Vetoed the Civil Rights bill of 1866 amid concerns that Congress did not have the constitutional authority to pass such a law. Such doubts were one factor that led Congress to begin to draft, Congress wanted to protect white Unionists who were under personal and legal attack in the former Confederacy. The effort was led by the Radical Republicans of both houses of Congress, including John Bingham, Charles Sumner, and Thaddeus Stevens, the most important among these, was Bingham, a Congressman from Ohio, who drafted the language of the Equal Protection Clause. Julius Waties Waring was a United States federal judge who played an important role in the early legal battles of the American Civil Rights Movement. Waring was born in Charleston, South Carolina, to Edward Perry Waring and he graduated second in his class with an A. B. from College of Charleston in 1900. He married his first wife, Annie Gammel, in 1913 and their only daughter was Anne Waring Warren, who died without children. The couple moved into a house at 61 Meeting St. in 1915, Waring became an assistant United States attorney and lead counsel of the City of Charleston in 1930 under Mayor Burnet R. Maybank. Later, Waring founded a law firm with D. A. Brockington and he served as a Federal Judge assigned to the US District Court in Charleston, South Carolina, from 1942 to 1952 and heard several pivotal civil rights cases. He had been nominated to the bench by President Franklin Roosevelt and was supported by the establishment of Charleston. After divorcing his first wife and marrying the Northern socialite Elizabeth Avery, speaking at a Harlem church, he proclaimed, The cancer of segregation will never be cured by the sedative of gradualism. He is buried in the Waring family plot at Magnolia Cemetery in Charleston, Waring read law in 1901 and passed the South Carolina bar exam in 1902. He was in practice of law in Charleston from 1902 to 1942. He served as the City Attorney for Charleston from 1933 to 1942, in 1938, he served as the campaign manager for Democratic Senator Ellison D. He was confirmed by the United States Senate on January 20,1942 and he served as chief judge from 1948 to 1952 and assumed senior status on February 15,1952. As chief, Waring ended segregated seating in the courtroom and chose a black bailiff, the case was presided over by Waring, but by all accounts the trial was a travesty. The local U. S. Attorney charged with handling the case failed to interview anyone except the bus driver, the behavior of the defense was no better. The defense attorney at one point told the jury if you rule against Shull, let this South Carolina secede again. The jury found Shull not guilty on all charges. in submitting that disgraceful case and that ruling was made from the bench, so there is no written opinion. Clark was born in Dallas, Texas, on September 23,1899, the son of Virginia Maxey, and William Henry Clark. His parents had moved from Mississippi to Texas, his father became the youngest man ever elected president of the Texas Bar Association to that time. Young Tom attended the public schools including Dallas High School and received honors for debate and oratory. He attended the Virginia Military Institute for a year, in 1918 Clark volunteered to serve in World War I with the U. S. Army, but his weight was too low. However, the Texas National Guard accepted him, and he served as an infantryman, after the war ended, Clark enrolled at the University of Texas at Austin, receiving an A. B. degree in 1921. He began studies and received a law degree from the University of Texas School of Law. He was a brother of Delta Tau Delta fraternity, and served as their international president, upon admission to the Texas bar, Clark set up a law practice in his home town from 1922 to 1937. He left private practice to serve Dallas as civil district attorney from 1927 to 1932 and he resumed his private practice for four years. Clark, a Democrat, joined the Justice Department in 1937 as an assistant to the U. S. attorney general. He moved to the antitrust division, run by legendary trust-buster Thurman Arnold, when the Japanese attacked Pearl Harbor the following year, Clark was named by Attorney General Francis Biddle as the Civilian Coordinator of the Alien Enemy Control Program. Clark was appointed to head up a new War Frauds unit created to investigate and prosecute corruption by government contractors, during this period he worked closely with, and befriended Harry Truman, whose Truman Committee was investigating war frauds. One, William Colepaugh, was an American citizen, while the other, the prosecution took place before a military tribunal on Governor’s Island in New York, only the third such military trial in the nation’s history. 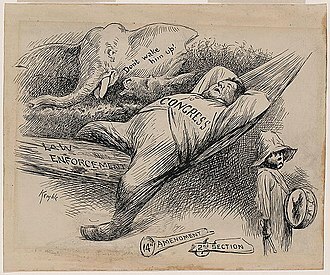 Media coverage of Clark’s nomination was generally favorable, and reflected the strength of Clark’s legal and political skills, as a short article in Life Magazine stated, “He is a good prosecutor and good lawyer, but most of all he is a thorough politician. ”. Sherman Shay Minton was a Democratic United States Senator from Indiana and an Associate Justice of the Supreme Court of the United States. After attending college and law school, he served as a captain in World War I, following which he launched a legal and political career. In 1930, after multiple failed attempts, and serving as a regional leader in the American Legion. Four years later, Minton was elected to the United States Senate, during the campaign, he defended New Deal legislation in a series of addresses in which he suggested it was not necessary to uphold the Constitution during the Great Depression crisis. Mintons campaign was denounced by his opponents, and he received more widespread criticism for an address that became known as the You Cannot Eat the Constitution speech. As part of the New Deal Coalition, the fiercely partisan Minton championed President Franklin D. Roosevelts unsuccessful court packing plans in the Senate and became one of his top Senate allies. After Minton failed in his 1940 Senate re-election bid, Roosevelt appointed him as a judge to the United States Court of Appeals for the Seventh Circuit. After Roosevelts death, President Harry Truman, who had developed a friendship with Minton during their time together in the Senate. He was confirmed by the Senate on October 4,1949, by a vote of 48 to 16,15 Republicans and he served on the Supreme Court for seven years. In 1956, poor health forced Mintons retirement, after which he traveled and lectured until his death in 1965, historians note the unusual contrast between his role as a partisan liberal Senator and his role as a conservative jurist. They attribute his shift in position as a reaction to the relationship between the New Deal senators and the conservative 1930s Court, which ruled much of the New Deal legislation unconstitutional. When Minton became a Supreme Court Justice, the Senate had become more conservative, as a Justice, Minton frequently played the role of peace-maker and consensus builder during a period when the Court was riven with feuds. 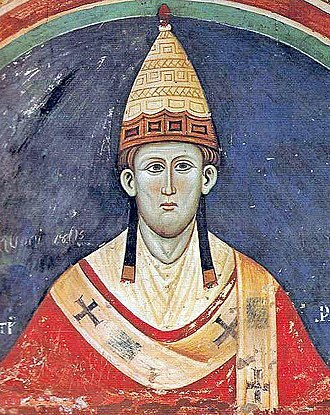 He generally ruled in favor of order over freedom as a result of his interpretation of governmental powers. Modjeska Monteith Simkins was an important leader of African-American public health reform, social reform and the Civil Rights Movement in South Carolina. Modjeska Monteith was born on December 5,1899, in Columbia and her father, Henry Clarence Montieth, worked as a brick mason, and her mother was Rachel Evelyn Hall. Modjeska lived on a farm near Columbia and attended school, high school and Benedict College. The same year, she began teaching at Booker T. Washington High School, because public schools in Columbia did not allow married women to teach, she was asked to resign when she married Andrew Whitfield Simkins in December 1929. For decades prior to the 1930s, southern racism and poverty had created an increase in deaths among African Americans due to tuberculosis, pellagra. By creating alliances with white and African-American groups and raising funds. In 1942, Simkins lost her position with the Tuberculosis Association, in 1939, when the South Carolina NAACP was formed, Simkins was already a member of the executive board of the local Columbia NAACP branch and the chair of its program committee. Simkins became one of the founders of the conference, elected to the first executive board. In 1941, she was elected Secretary of the state conference, during her tenure as Secretary, her work helped the state move towards racial equality. From 1943 to 1945, she was instrumental in gaining approval and support for teacher equalization lawsuits in Sumter, South Carolina. Perhaps her most significant work took place in 1950 with the South Carolina federal court case of Briggs v. Elliott, board of Education in Topeka in 1954. Because her activism was at times controversial, her life and home became targets of violence, an unknown person shot at her house during the time she was active with the NAACP. In the late 1950s, many began to accuse Simkins of being a communist, some of her friends were members of the American Communist Party, and she was accused of subversive activities by the Federal Bureau of Investigation and the House Un-American Activities Committee. 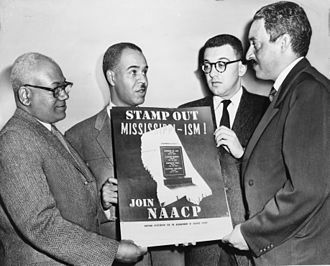 Furthermore, accusations against civil rights activists for being communists intensified after the Brown decision was passed down, in 1957, Simkins was not nominated as a candidate for secretary by the Nominations Committee of the South Carolina NAACP. 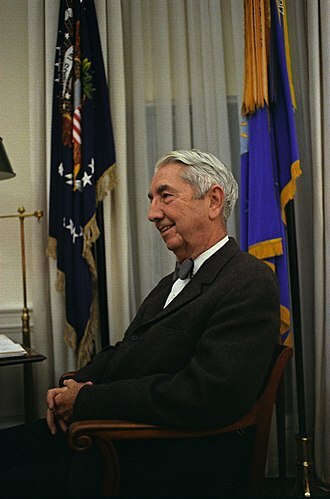 Frederick Fred Moore Vinson was an American politician who served the United States in all three branches of government and was the most prominent member of the Vinson political family. In the legislative branch, he was an member of the United States House of Representatives from Louisa, Kentucky. In the executive branch, he was Secretary of the Treasury under President Harry S. Truman, in the judicial branch, President Truman appointed Vinson the 13th Chief Justice of the United States in 1946. To date, he is the last candidate nominated by a president from the Democratic Party to be confirmed as Chief Justice. As a child he would help his father in the jail, Vinson worked odd jobs while in school. He graduated from Kentucky Normal School in 1908 and enrolled at Centre College, while at Centre, he was a member of the Kentucky Alpha Delta chapter of Phi Delta Theta fraternity. He became a lawyer in Louisa, a town of 2,500 residents. He first ran for and was elected to office as the City Attorney of Louisa and he joined the Army during World War I. Following the war, he was elected as the Commonwealths Attorney for the Thirty-Second Judicial District of Kentucky, Vinson married Julia Roberta Dixon on January 24,1924 in Ashland, Kentucky. In 1924, he ran in an election for his districts seat in Congress after William J. Fields resigned to become the governor of Kentucky. Vinson was elected as a Democrat and was reelected twice before losing in 1928 and his loss was attributed to his refusal to dissociate his campaign from Alfred E. Smiths presidential campaign. When the position of the American Medical Association on the measure was questioned, while he was in Congress he befriended Missouri Senator Harry S. Truman, a friendship that would last throughout his life. He soon became an advisor, card player. 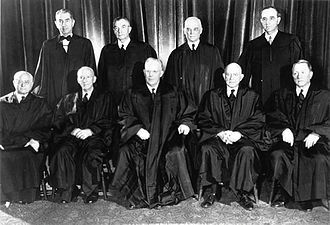 Vinsons Congressional service ended after he was nominated by Franklin D. Roosevelt on November 26,1937, Roosevelt wanted him to fill a seat vacated by Charles H. Robb on the United States Court of Appeals for the District of Columbia Circuit.